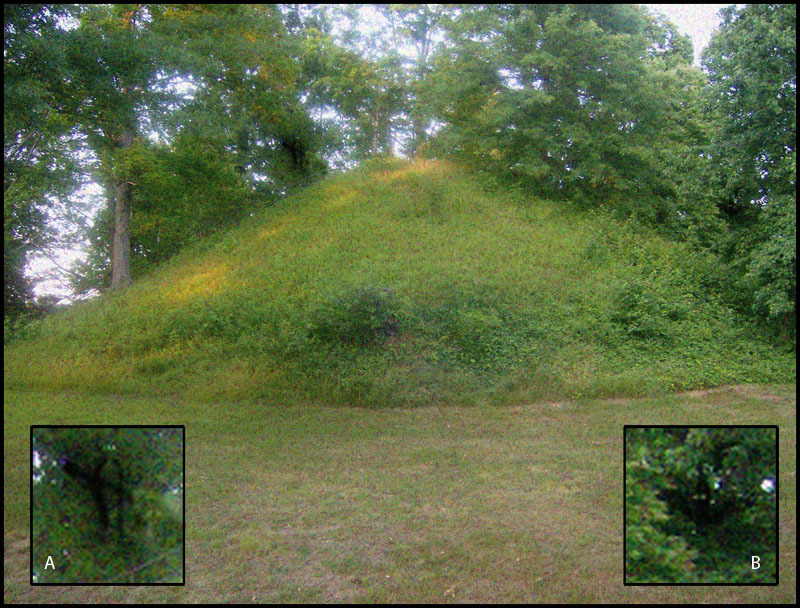 Mississippian mound near Crab Orchard Lake in Illinois. This variety of mound is generally attributed to the Mississippian culture between 900 and 1450 CE, after which the culture seems to have largely dispersed or collapsed. Photographs of these earthwork monuments routinely develop unusual dark artifacts not visible at the time the photo was taken. In this picture, the artifacts areas appear to be slender, vaguely humanoid shapes (see inset detail). Note the scale in inset A: the railing in front of the “figure” is approximately three feet high, so the figure would be in the range of 8-9 feet tall. According to local legend, these are the ynirono or “tomb guardians”. It is generally assumed that the drastic decline in the pre-Columbian civilizations of North America was due to epidemics introduced via contact with European explorers. However, recent archaeological data indicates that this decline began as early as 1350 and that the arrival of Europeans only served to weaken a greatly reduced population. The causes for decline in the prospering Mississippian and Oneota civilizations, therefore, remain a great mystery. This is the first evidence of such mass graves in the area. In a time of increasing political turmoil and tribal warfare, it is uncertain if these were the battle dead or sacrificial prisoners - the presence of blood remains certainly indicates the latter. Another possibility forwarded by LeRousse et al. is the spread of a hemorrhagic illness similar to the Marburg and Ebola strains, which would also explain the precipitous population decline. Plates 17-19 illustrate artifacts typically displayed on photographs of earthworks such as the ones at Shiloh and Crab Orchard Lake (i.e. those constructed circa 1350). The detail insets show the artifacts to be slender figures much taller than a human with multiple long, curving limbs. It is uncertain what these figures might represent, but it is generally agreed that they were not present at the time the photo was taken. It is these artifacts that may have lead to the recurring “Slender Man” scares in the midwest in the mid-20th century. And, as loath as we are to admit it, there may be some truth to these scares: de Soto’s initial inroads into the North American continent brought him in contact with remnant Mound Builder tribes that told him the mounds were tombs for the mikota “Great Ones”, not mico “nobles” as is commonly assumed.